When are they held and at what time? 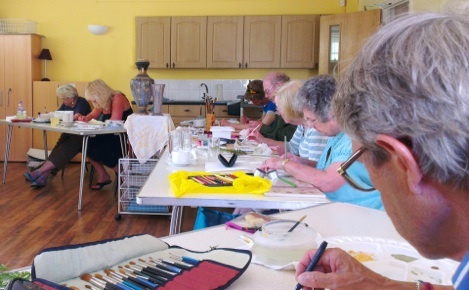 Group classes cater for all levels of experience: beginners and experienced painters. Classes are on a pay as you go basis and competitively priced. Classes run at The Wisdom Centre, Romsey (in the old La Sagesse convent) on Mondays 13:00 - 15:00 and 15:15 - 17:15. The class is 2 hours long. The first part of the class consists of a 40 minute session led by me. The second part is for the individual to experiment with the skill that has been taught. In the group class, we focus on watercolours and on occasion pastels, acrylics, pen and ink, collage. The emphasis is on enjoyment and getting to know everyone. At the first session, all materials will be supplied. After this time, you are encouraged to purchase your own.